The Buck House Inn on Bald Mountain Creek, in Burnsville, NC is just 45 minutes north of Asheville. 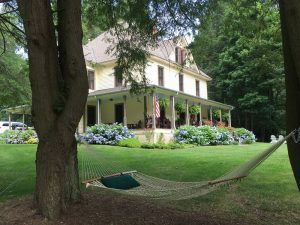 The 1904 renovated Inn is the perfect setting for a retreat, a family reunion, or a romantic getaway, sitting on 8 acres at an elevation of 3,200 ft. Innkeepers Debbie and Sam Stebbins have a passionate desire to offer you the best in service and hospitality by providing you an opportunity to disconnect from your routine or hurried lifestyle and reconnect with yourself, a loved one, God, or all three in comfortable accommodations amid the mountain splendor.